A spring is the most important component a designer comes accross during his proffesional career. Industrial springs are manfactured and sold in wide varieties and sizes. Following image gives the idea about the wide range and variety available of springs. A designer of spring must consult the manufacturers catalogues to get the idea of what sort of springs are readily and commercially available, to avoid the unnecessary custom making charges. From above pictures it is clear that springs are available in wide ranges and as per the requirement of the customers. General springs are made up of Spring steel, Stainless steels (of grade 302,304,316) or Mild steels. Inconel is also used for making springs. Inconel is a family of austenitic nickel-chromium-based superalloys which are oxidation-corrosion-resistant materials well suited for service in extreme environments subjected to pressure and heat. Indian Standard IS 4454 :2002 Deals with the "Steel wire specifications used for making the spring". One snap shot of this standard is given below, The IS document is attached with this article. Indian Standard IS 7906 :1997 Deals with the "Helical Compression springs". It has all detailed parameters and specifications. One snapshot of this standard is given below, The IS document is attached with this article. Compression Springs Na=Nt−(X1+X2) Where X1 and X2: are the number of turns at each end of the coil. (b) When the end of the coil is not in contact with the next coil, and the spring end has of a turn. The solid length of a spring can normally be obtained by using the following simplified formula. Generally, the purchaser of a compression spring does not specify the solid length of the spring. As for those compression springs, both ends of which are shaped as shown in (b), (c), (e) or (f) of Figure 2 and for which the solid length needs to be specified, the following formula can be used to obtain the maximum solid length. However, the actual maximum solid length can be greater than the value thus calculated depending on the shape of the spring in question. where, (t1+t2) : is the sum of the thicknesses of the coil ends. where dmax : d is the material diameter with the maximum tolerance. Cold-formed solid-coiled tension springs are subjected to initial tension (Pi) The initial tension can be obtained using the following formula. Coil End Shape On solid-coiled piano wire, hard steel wire, and other steel wires that are not low-temperature annealed, the initial stress occurs within the hatched range shown in However, if materials other than steel wire are used, or the wire in question is low-temperature annealed, the initial stress taken from within the hatched range in Fig.3 should be corrected as follows. (1) When using stainless steel wire, decrease the initial stress value for steel wire by 15%. 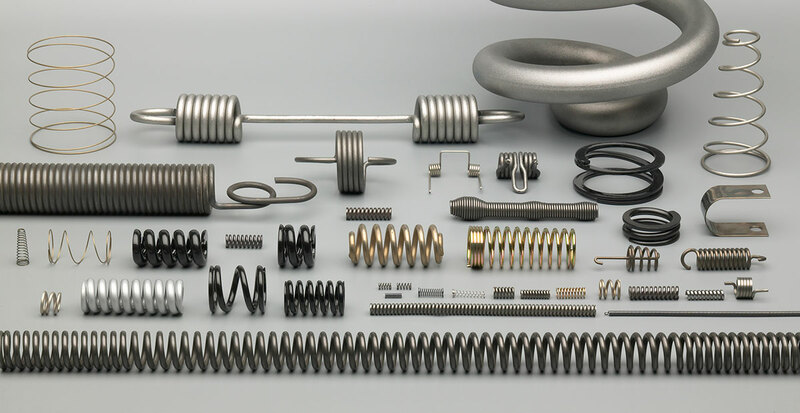 (2) If the spring is low-temperature annealed after being formed, decrease the value by 20~35% for springs made of piano wire, hard steel wire, or other stainless steel wires, and by 15~25% for springs made of stainless steel wire.